Here are the broad strokes of what it takes to build a Trekboxx system, and a bit of insight into the design. A range of materials are utilized where their positive characteristics can be used to our advantage. The main system is made from Baltic Birch plywood. Different thicknesses (12mm, 15mm, and 18mm) are used to minimize weight where possible. You can read about the benefits of Baltic here. The systems are designed and redesigned in CAD, pouring over every detail. There are almost no interchangeable parts between systems. Each system is designed to maximize the space in the specific vehicle model. The wood parts are then programmed and cut on an industrial CNC router, which keeps the parts very accurate and consistent. After being transported back to the shop, the parts are de-burred and sanded. Since the CNC router can only cut holes perpendicular to the sheet, other angled holes are now drilled using a jig. The parts are assembled with waterproof glue and screws. Any imperfections are filled with automotive filler. They are final sanded, inspected, and sent to LINE-X. At the LINE-X shop they are heated to reduce moisture content, and then sprayed with numerous layers of the material, which is applied under heat and pressure. A second specialized coat is applied in the final color which is UV-resistant. After curing, the parts return to the shop where the LINE-X is carefully drilled out of numerous holes and slots. They are set aside for assembly. 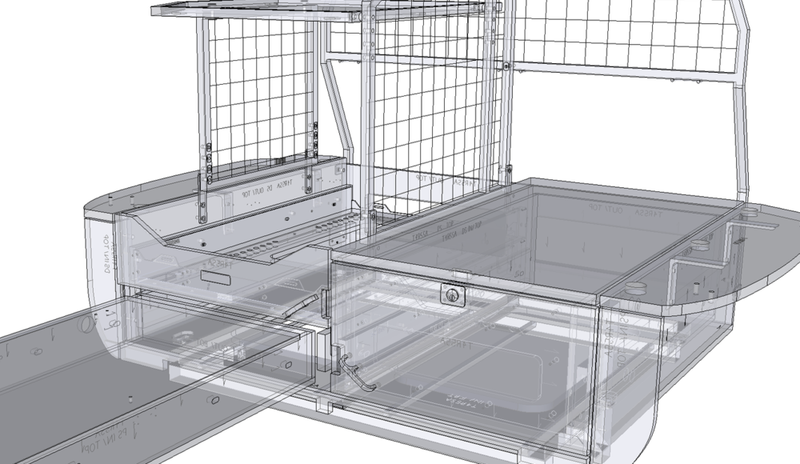 The cargo barrier, divider, fridge barrier, and shelf are also CAD designed. The files are sent to a laser tube cutting service where a specialized machine accurately cuts all of the holes, slots, and pie cuts. After delivery to the shop, the parts are then de-burred and clamped in a fixture. The frames are then tig welded on the fixture. Weld nuts are welded on so washers and nuts don’t need to be used for assembly. The welded wire mesh is cut and welded on as well. The mesh is 2x2” square for good visibility and allows the use of molle bags or pouches. On the cargo barrier there are custom mounting tabs that are laser cut by yet a different laser cutting service, and on the shelf different laser cut tabs are welded on. These are for mounting the center part of the shelf later, which is Baltic Birch. The cargo barrier, divider, fridge barrier, and shelf frame are sent to LINE-X. There are also small laser cut plates that will mount the fridge barrier and divider to the main system. These are counterbored and sent to be powder coated. The fridge slide consists of a metal framework with a Baltic floor. This is to maximize space, minimize weight, and the Baltic surface allows the end user to easily drill holes for fridge mounting, or screw other accessories into the surface. The metal frame is laser cut steel which is 4-5 parts, depending on the system. They are bent on a CNC press brake, and then installed in a fixture and tig welded. The frame is sent to powder coating. The “wings” are supported by aluminum brackets which are custom made. They are cut on an automated cutoff saw from 1/4” thick structural aluminum angle. They are sent to a CNC mill where the mounting holes are accurately drilled. They return to the shop where they are de-burred and then sent to be powder coated. There are 3 locks on a standard system. The large and shallow drawer under the fridge both have a heavy duty flat-bolt style lock that mounts in the drawer face. They are substantially more robust than most cabinet or drawer style locks on the market. They also take up very little interior space. But, they don’t come in black. So, they are disassembled, including springs and lock pins and sent to powder coating. Upon returning to the shop any extra powder coat is sanded off of mating surfaces and the locks are reassembled. The 3rd lock is actually a hidden lock that is key-matched to the other 2 locks. This lock mounts under the wing on the passenger side and is hidden from view unless you are really looking for it. When pushed, it’s bolt engages a custom made striker that is mounted to the side of the large drawer. This striker is also powder coated aluminum. The Richlite R100 cutting board/work surface is custom made for each system. R100 is a phenolic material made from recycled cardboard and phenolic resin that is made under heat and pressure. It is incredibly rigid, durable, and good looking. 5’ x 10’ sheets of the material are shipped from Tacoma and are cut to manageable sizes with a specialized track saw. Using pattern templates, they are then cut slightly oversized and then pattern routed to final dimensions. Mounting holes are center punched and the parts are routed again to round the edges. Holes are drilled and couterbored. The parts are sanded and then finished with a homemade paste of mineral oil and pure beeswax before being buffed and set aside to dry. The drawer slides are top of the line Accuride slides. The yellow latch covers are cut off and the metal underneath is sanded and cleaned with alcohol. New black covers are made using a custom mold which is heated and then dipped in vinyl plastisol. The mold is baked in an oven to set the covers. After cooling they are separated from the mold and trimmed to length. The mold release is cleaned from the inside of the covers and they are glued onto the latches. The slides are inspected for free play when closed and adjusted to keep them rattle-free. Once all of the parts return from LINE-X and powder coating, assembly begins. The assembly for a standard system takes a full day. 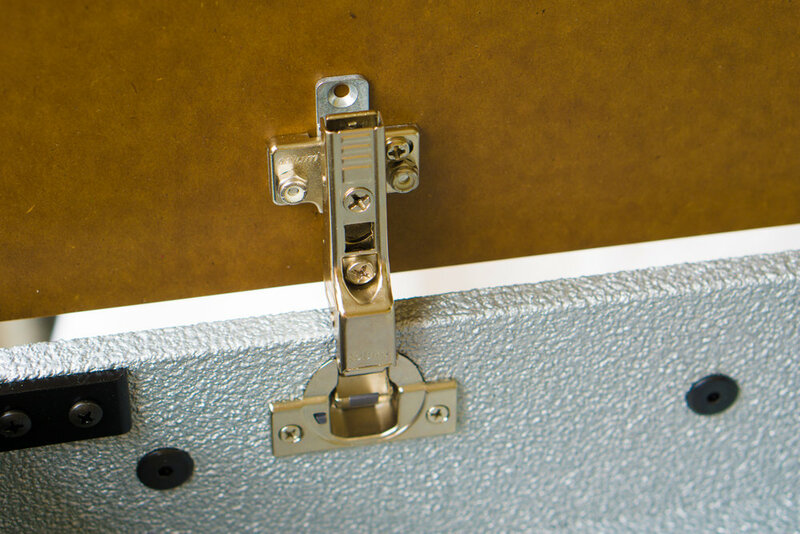 This includes adjusting all hinges, locks, and clearances. There are approximately 610 pieces of hardware used in building one system. The system is partially disassembled (cages and shelf removed) and a custom wooden crate is built. The system is bolted to the crate and wrapped for packaging with instructions and the remaining hardware needed for installation. We’ll discuss the System Alpha here, as it is by far the most popular. 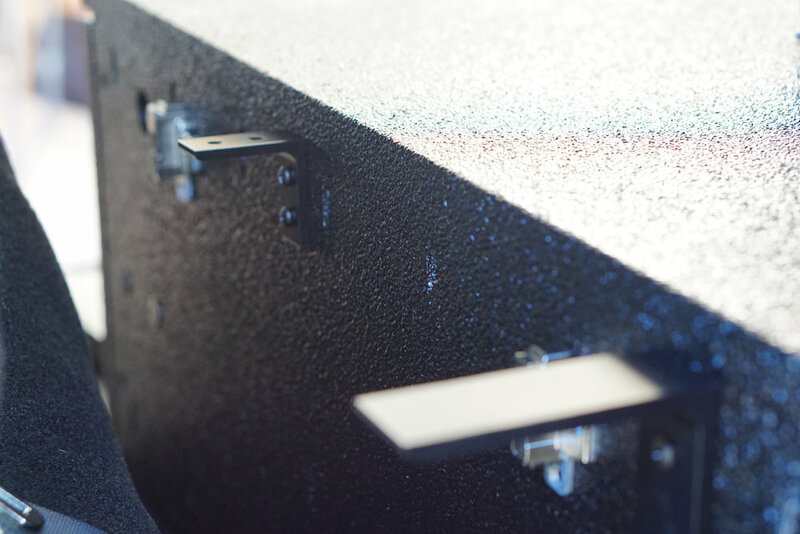 The idea behind this system was to provide high-quality secure storage day to day, and a convenient system for outdoor exploration when you want to get away. This is opposed to a more dedicated "kitchen", because not everyone uses the system for only camping all of the time. The system is coated with LINE-X as it is, in my opinion, the best looking and most durable coating on the market. It is also repairable, but I have not yet heard of a system needing to be repaired, except for an early system where a customer dropped a drawer face onto the concrete, removing the coating from the corner. This can be easily touched up. The LINE-X helps reduce sound from items inside the system rattling around. It is bomber. Main box - skeletonized where possible to reduce weight and promote cooling for the fridge. Also provides access to the interior of the large drawer area, and in certain models access to in-floor storage areas. The center bulkhead of the system has an offset design to minimize space lost from the drawer slides. The top of the main box is made from 18mm Baltic Birch, for strength and to allow easy mounting of tie down track, hardware, etc. Fridge slide - consists of a metal frame for space efficiency with a Baltic Birch floor to allow easy end-user modification. The floor can be replaced inexpensively if there are ever any major errors when modifying. The metal structure has hanging brackets which hold the drawer slides for the shallow drawer below. This places the slides on top of one another to prevent lost space when nesting slides side-by-side. Mounting holes are slotted to allow fore/aft adjustment to align fridge slide with the front plane of the system. There are integrated slots for fridge tie downs as well as rows of holes to accommodate single position quick-release tie down rings. Shallow drawer - this lockable drawer fully extends from below the fridge area, and has the Richlite work surface on top. It was designed as low as possible to keep the fridge at a reasonable level, yet large enough to house popular stoves. It is also great for an odds and ends drawer. Mounting holes are slotted to allow fore/aft adjustment to align drawer face with the front plane of the system. I am aware that some companies use this space under the fridge for mounting a stove. I didn’t do this for a few reasons. First, having your stove mounted to the rig when you’re miles from nowhere just doesn’t seem prudent. Second, the work surface is much more useful day to day, and is more likely something that you would want to deploy quickly vs. a stove. Normally if you are going to use a stove to cook you are staying a while, so you have time to get it out. My solution for those that really want the stove attached to the system is the Aux Work Station. It quickly attaches to the large drawer and will hold a stove. That way you have the best of all worlds- stove on the system yet easily removed in case of a fire, and full access to the prep surface. Richlite work surface - heat resistant and finished with food-grade oil and wax. It attaches to the shallow drawer with soft-close quick release hinges that are adjustable in all directions. There is an adjustable magnetic catch to keep the Richlite from rattling. Large drawer - this large drawer has 2 locks for extra security (one hidden). Also has installed t-nuts to attach the Aux Work Station. Mounting holes are slotted to allow fore/aft adjustment to align drawer face with the front plane of the system. Drawer faces - they are mounted to the drawer fronts with numerous screws and are adjustable up/down and left/right to obtain even clearance. This also allows them to be replaced without replacing the whole drawer. Drawer slides - they are full-extension and lock in, out, and halfway out. They have had a 500 lb. rating, but have recently been upgraded to 600 lbs. They require little maintenance and and free play can be removed by bending the rear tabs tighter against the integrated bumpers. Wings - they are matched to the vehicle’s interior perfectly, to ensure an even gap and no rubbing during body twist. Mounted on soft-close hinges for full access to the space around the wheel wells, they are quick-releasable if needed. They are adjustable in all directions. The wings also have custom sewn webbing pulls and footman loops to assist opening. Wing faces - these have hidden hardware yet can be easily removed without any other disassembly. They are Baltic Birch as well, so the end user can drill holes and cutouts for switches, air hookups, etc. If plans change they can be easily replaced. Divider - keeps cargo away from fridge for cooling and from falling behind fridge when deployed. Attaches to the main system using custom barrier tabs designed to absorb any flex between the upper and lower components of the system. Fridge barrier - just like the center divider, the fridge barrier makes the space outboard of the fridge totally useable. Both the fridge barrier and divider are set back from the front of the system to allow you to carry longer items across the front of the system. The fridge barrier set back more than the divider to allow easier access to the items stored on the driver side wing area. Shelf - this has a metal frame with a Baltic Birch shelf. This is to allow easy modification, accessory mounting, and even replacement if necessary. The shelf adjusts vertically to accommodate popular fridges while maintaining as much shelf space as possible. Well, that’s it for now. There’s probably a bit I’m forgetting, but that covers most of the bases.